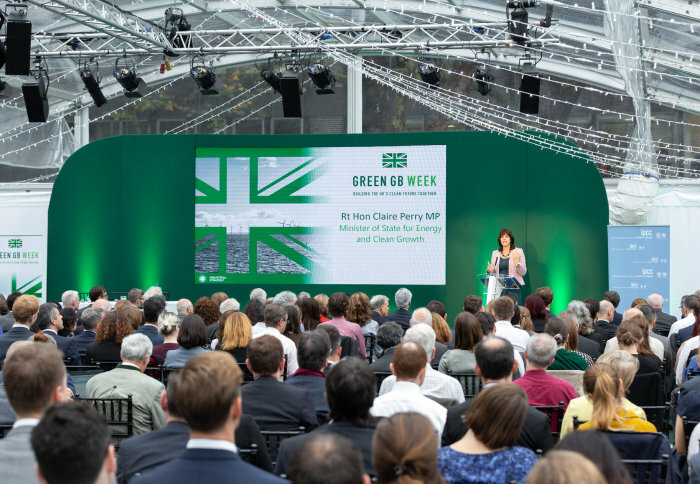 "This week is to celebrate what we’ve done and to challenge ourselves to do more," said Minister of State for Energy & Clean Growth, Claire Perry. Green Great Britain & Northern Ireland Week (Green GB Week) has launched with the aim of highlighting the opportunities that clean growth offers the United Kingdom, and raising understanding of how businesses, entrepreneurs and the public can contribute to tackling climate change. The opening day of the first ever Green GB Week centred on the threats to human health, national economies and the environment presented by the changing climate, and the unprecedented scale of changes needed to avoid the effects of more extreme global warming. The launch event was held at Imperial College London and hosted by the College's Grantham Institute – Climate Change and the Environment, and was the first of many events held around the UK during the week. The event also served as a Europe-wide launch of the Intergovernmental Panel on Climate Change (IPCC) Special Report on Global Warming of 1.5°C, which the United Nations published last week“, amid calls to cut the emissions of climate change-causing carbon dioxide gas by 45% by the year 2030. During the ceremony, an audience of policymakers, politicians, businesses, NGOs and scientists heard about the findings of the Special Report from some of its lead authors, and participated in discussions of what the world, and the UK in particular, can do to limit global warming to a maximum of 1.5°C, as determined by the UN's 2015 Paris Agreement on climate change. Minister of State for Energy & Clean Growth Claire Perry, in her opening speech, pointed to all the ways the UK has made progress in reducing greenhouse gas emissions, such as enjoying our first days without coal power in over a hundred years, building record numbers of electric vehicles and opening the world's largest offshore wind farm. She said: "Now it is time for us to act. Everyone has a part to play. We are facing an enormous challenge, and by acting now in the UK we can help the rest of the world make that transition." She also said that as well as celebrating what we’ve done, we must challenge ourselves to do more, saying the government is investigating what it can do to achieve a zero-carbon economy. Government Chief Scientific Adviser Dr Patrick Vallance, speaking at the event, said the IPCC Special Report offered chances for change: "Keeping global warming at 1.5°C gives a chance for vulnerable ecosystems, whether coral reefs or insects. It gives us a chance to limit sea-level rise to a manageable level. Because the individuals most at risk are the most deprived and marginalised, it also gives us a chance to avoid putting millions more into poverty." The speakers highlighted the importance of innovation – both in achievements, such as in battery technologies and carbon capture and storage – and in future investments. Imperial's Vice-Provost (Research and Enterprise), Professor Nick Jennings, said: "We are proud to be creating funding and opportunities for startups and entrepreneurs to develop successful cleantech products and low-carbon businesses. "Our Centre for Cleantech Innovation and EU-funded Climate-KIC programmes have supported the founding of 80 new cleantech businesses since 2012. They are successful pioneers - raising over $140 million (USD) of investment, and creating more than 500 jobs." The main findings and implications of the Special Report were given by Deputy Executive Secretary of the United Nations Framework Convention on Climate Change Ovais Sarmad, IPCC Chair Dr Hoesung Lee, Special Report lead author Professor Rachel Warren from the Tyndall Centre for Climate Change Research, and Co-Chair of IPCC Working Group III Professor Jim Skea from the Centre for Environmental Policy at Imperial. The audience also had the opportunity to ask some of the report's authors their questions, and to meet Grantham Institute researchers who work on topics such as pathways to decarbonise our society and the co-benefits of climate change action. Professor Jennings added: "We are also committed to getting our own house in order, recently launching a programme of activities about Greening Imperial. Through this initiative, we aim to improve our own operations, education and communication around sustainability and action on climate change." 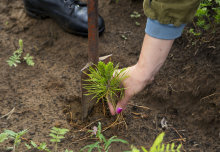 Read more about Imperial events happening during Green GB Week. BBC - Is meat's climate impact too hot for politicians?